1977 - Exhibition of Ichiyo (-1983). Member of Ichiyo-kai in1982. 2000 - "ASEAN Art Now” at Las Vegas award. 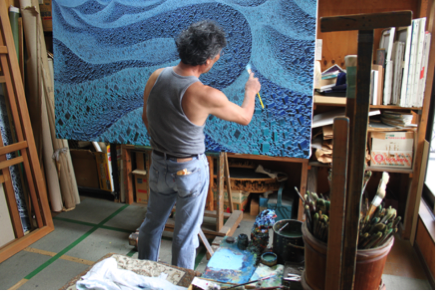 2012 - Duo Exhibition w. Hidetoshi Takahama “A Shape of Water & Life”, Nagasaki. 2014 - “Huge Power”, Kagoshima. Duo Exhibition w. Takamichi Ito “Wind and Light Flow through Life City”, Okayama. 2016 - 40th Anniversary Exhibition “Expose the City”, Ichiryusha Gallery, Tokyo. ​Mr Satoshi Koyama was born and raised in Amakusa city, a small town, in the prefecture of Kumamoto (an island in Southern Japan). He grew up close to nature with great surroundings, and did not come in contact with Tokyo, the mega city, until in his early twenties. He was shocked: "My first impression of the huge city was unforgettable. The huge city seemed to continuously increase perpendicularly horizontally and filling crevices, islands, forests”. ‘Life City’ series which is the lifework of Mr Koyama was borne accidentally in late 1970s. Aerial photography of Tokyo and a view from Kasumigaseki Building which was the tallest building in Japan at that time was the starting point for paintings in the ‘Life City series’. Mr Koyama claim that in the present age a city should be the place where people are supported equally, while considering the continuous struggle and delicate balances between economic growth and use of space for buildings etc., as well as the balance between basic requirements for people and nature to survive and flourish. His work in the ‘Life City Series’ raises the ever so valid question about how sustainable mega city growth models should be to balance with nature – How to obtain symbiosis between various interests which may well include significant undertakings to reserve, give rebirth, or reclaim areas as well as to over time review and balance cities growth with requirements for sustainable and acceptable life conditions. Mr Koyama’s artwork certainly does that!